Angry Birds Seasons is the sequel to the smash-hit Angry Birds. 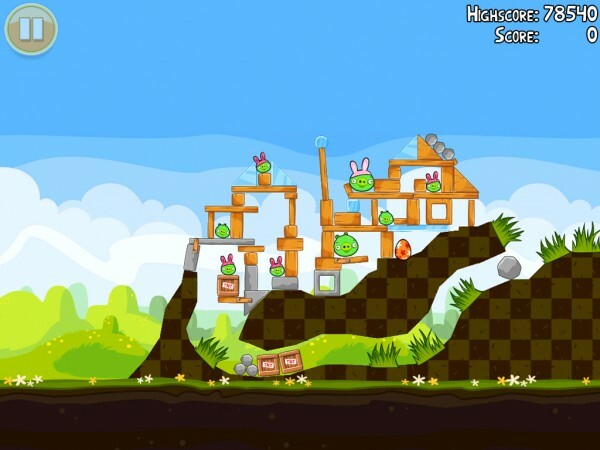 First available as Angry Birds Halloween in October 2010 for iOS devices, it was renamed and launched on Android as well with Christmas themed levels in December. This simple game about throwing angry birds at enemy pigs who stole their young eggs has been expanded to various holidays since, including Halloween, Christmas, Valentine's Day, St. Patrick's Day, and now Easter. The fun and addictive gameplay has been expanded to include seasonal themes, wickedly hard levels, and more. Like its predecessor, there is very little plot to Angry Birds Seasons. The game is divided up into scenarios with each offering up a simple plot showing how the pigs are stealing the helpless bird's eggs. Being the protective parental birds that they are, they take revenge for their young. Without much consideration for their own well being, they set up a large slingshot and take to the skies. And this is done with just a swipe or flick across the screen in an incredibly intuitive way. 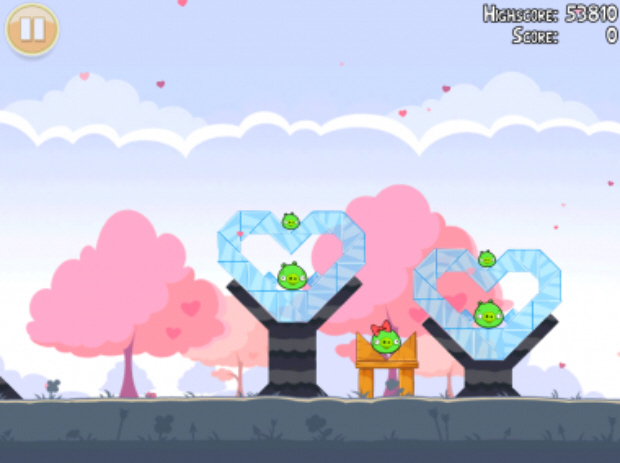 Angry Birds Seasons is a 2D Physics game somewhat similar to classics like Scorched Earth or Worms - but instead of shooting weapons at each other, they shoot themselves. The pigs have set up defenses against the birds' assaults. These defenses take many forms including wood, ice, or even rock. They also seem to like to play with dynamite, cannonballs, and other destructive objects. To counter these many kinds of defenses, the birds work together. There are several kinds of birds like the simple red bird that impacts the target, or the yellow bird which charges high speed for more destructive power. Other kinds include the blue ones which separate into three, the white ones which drop explosive eggs, and everyone's favorite black ones which explode. Each level has a predefined sequence of birds that you can use to destroy the enemy, and if you defeat them without using all of the birds available you get a large amount of bonus points. And this game is all about the points. When you complete each level, depending on your score, you can get one, two, or three stars. While the game play in and of itself is fun and entertaining, it's the pursuit of perfection that can drive a player to really get hooked. There are also secret bonus golden eggs available throughout the game. These eggs only need to be hit once regardless of whether or not you complete the level in that round. Once you get one, a new bonus level opens up in the golden egg section. When your weapon of choice hits the target, the physics engine takes it from here and it's very satisfying. One little knock can cause a chain reaction that can potentially rock, sway, wobble, and fall such that it could potentially destroy the entire level in one hit. Each material breaks down uniquely, with some types more brittle than others, or requiring a harder hit than another to break. For example, the large explosive black bird can ploy through stone easily, but wood blocks can slow it down fast. The opposite is true with the yellow fast-moving wedges: wood breaks easily but stone is nearly impenetrable. A small change made to Angry Birds Seasons is that they added new additional materials that the levels can be constructed out of with new rules. For example, snow can be plowed through easily, but it may not fall like you expect, presumably because snow can clump. Others include clouds, which can float on their own and hold up other structures, until hit by a bird. I found the cloud structures a fun mechanic; the snow not so much. Another change is that they added themed objects that can be broken in each level to earn more points. The basic formula of Angry Birds is mostly unchanged; it's just more of the same, which isn't all bad. The graphics and sound for each crack, smash, or explosion is quite satisfying. While it won't shake you in your chair (it's a phone!) it's oddly enjoyable watching and hearing the whole world the pigs constructed for themselves collapse or blow up in their faces. Everything appears 2D graphically, though the rendering itself uses OpenGL or similar technology. The game also features almost iconic bird 'craw' sounds that are instantly recognizable to anyone who has played the game. Fortunately the game is perfectly playable with the sound completely off. Angry Birds Seasons is a simple, fun game that is more of a good thing. And not only that, but this game is much harder than the original Angry Birds, so it presents more of a challenge. Each level can be completed in a very short time frame, often less than a minute. Getting all three stars per level can take many tries to get just right. On top of that, this game offers over one hundred and twenty five levels, with many hidden levels, and Rovio has been updating the game with more quite often. On Android, this game is free, with ads being displayed in the upper right corner. It's noticeable, and really the only downside to this game at all. If this is a problem, there is now an ad free version available for purchase on the Amazon app store. The only moral issue at all is that the main plot is about revenge against those bad pigs – and there is violence as you smash into them. There is no gore at all; the pigs just disappear. This series has taken the mobile world by storm – and for good reason. I've played this a ton myself, and I don't think I'm done yet. And Rovio recently released Angry Birds Rio to add to the fun.